SEOUL (Reuters) – Samsung Electronics Co Ltd plans to begin building a new memory chip production line in China in late March, a spokesman said on Thursday, as the tech giant ramps up efforts to boost NAND flash technology to meet future demand. The tech giant said in August last year that it expected to invest $7 billion over the next three years to expand its NAND memory chip production in China’s northwestern city of Xi’an, but had not specified a future schedule. The rapidly growing data center market, which needs more memory capacity to handle increasing data traffic, is expected to underpin revenue growth and margins for Samsung’s NAND Flash business in 2018, research provider Trendforce said. Samsung’s revenue from NAND in the fourth quarter of 2017 rose 9.8 percent from the previous quarter to $6.17 billion, Trendforce said, as demand from both smartphone and server markets lifted shipments and average price. Samsung will formally begin the process near month-end at Xi’an, earmarked for NAND flash production, the spokesman said, but did not give any other details. 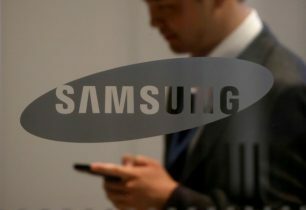 Samsung Electronics shares have risen about 13 percent from early March on an improved outlook for the memory chip market, putting to rest concerns that the recent boom might end, analysts said. “Memory chips are solid. For DRAM chips, server demand is very strong,” said Kwon Sung-ryul, an analyst at DB Investment & Securities. The expansion is not expected to affect memory chip supply until 2019 at the earliest, analysts said.